← IS SHAME PURSUING YOU? 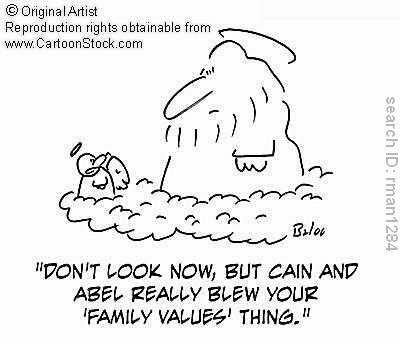 Shame is part of nature’s plan to keep us from the sin of Cain, from doing the unforgiveable, killing our brothers. Considering how humanity is so often at war and killing, it seems shame fails more often than it succeeds. The trick to taming shame is similar to Aristotle’s statement about anger. You need the right amount of shame directed at the right person, in the right amount, and for the right reasons. The right reason for shame is always to stop someone from doing something unforgivable. As noted in the cartoon, the highest powers often fail in their efforts to help their children use shame for the right reason. The first step to helping children if for you to deal with any difficulties you have with shame. TIP ONE: Let go of the shame from the past. You cannot change the past. Make amends to those you have hurt if that is possible, and then let go. TIP TWO: If shame is warning you about unacceptable current behavior. Stop any behaviors shame is designed to stop. If you cannot stop such behaviors, get compentent help. Otherwise, make any amends you can to those you have hurt and go on. TIP THREE: Observe the four rules for living the good life: respcect self, others, property, obey the law. TIP FOUR: Think more logically about the cause of your shame. First let us presume you feel shame about beating up your brother and leaving him with a scar on his face, every time you see him, shame visits. Because the event happened years ago, you are carrying false shame. Moreover, when we are thinking illogically, we generally make one of the following mistakes. These are the common illogical mistakes. Something gets left out. “I was never nice to him.” You let him tag along your friends, your often gave him half your allowance when he lost most of his for being bad, you stood up to bullies for him. In fact, you were more nice than mean. Something gets added. ‘‘I know he hates the scar and no matter how he acts, he hates me.” Actually, your brother thinks the scar makes him look tougher and sexier.” He loves you. but has a hard time admitting it. Remember the flowers he sends you every so often with a funny note. Sometimes we have the right facts, but we draw the wrong conclusions. “I offered to pay for him to have some plastic surgery, but he laughed at me and refused.” He likes to hold what I did over my head. Sometimes we let our feelings determine if we are right or wrong. “I just feel like he hates me.” Those feelings are wrong. TIP FIVE: Practice self-soothing and calming self talk whenever shame tries to visit. Concentrate on finding slogans to battle illogical beliefs. Learn and practice the Twelve Daily Emotional Fitness Exercises. If shame continues to disturb you, seek therapy. TIP ONE: As noted above, deal with your own shame. TIP TWO: Make the important rules clear and enforce them. If you read my blog, you know them: Respect self, others, property, and the law. The younger the child, the more it is up to you to enforce the rules. By seven or eight, the child not be hurting self or others, not destroying property. He or she should also be reasonably obedient and law abiding. If not, a good mental health evalution is indicated. All the experts agree a child who hurts self or other, is cruel to animals and destroys property particularly by setting fires is a child needing special care. TIP THREE: Observe the Five to One rule. Five positives for every negative. TIP FOUR: Teach self soothing skills. You have strengths and talents. Be kind to me, like this post or share it. You will be helping me stay strong and maybe some others as well. You will also be practicing one of the 12 Daily Emotional Fitness Exercises. Click here to learn more about the 12 Daily Emotional Fitness Training Exercises. This entry was posted in Parenting Issues and tagged Emotional Fitness Training, Emotional Health, Four Rules of Living the Good Life, Health and mental health, help for parents, Katherine Gordy Levine, Thinking about what matters, Tips to tame shame, What is a parent to do.. Bookmark the permalink.